My favorite ”on the road” project is weaving bookmarks. Many times I find myself at night in a deserted hostel in some small town with no internet access and nothing to do so I entertain myself by weaving bookmarks. There always seems to be a bed rail or something to tie my loom up to. 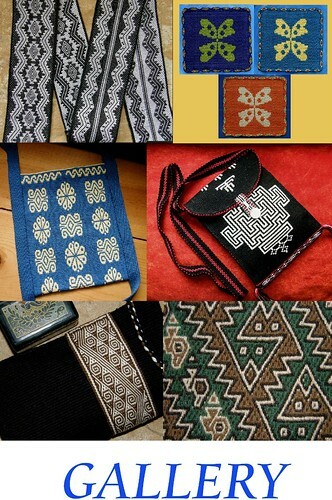 I make bookmarks, key fobs and sometimes small coin purses to give away to fellow travelers and weavers that I meet along the way. Often I swap coin purses with weavers and spinners for interesting spindle whorls, small tools or other bits and pieces. I take all my loom rods with me in my backpack as well as a nifty little warping board that I made which was inspired by my very first weaving teacher in Huancayo, Peru. My teacher, Margarita and her daughter used to come into town everyday with their little warping board to teach me. My warping board is even smaller than this one. It is basically a flat narrow stick about the thickness of a ruler and I use long screws in place of nails as I can secure them to the board with the nut-no leaning warping stakes. It gives me a warp just long enough to make one bookmark or two key fobs. I use two or three widths of warp from this board to make a coin purse. I like to start my woven pieces with a smooth edge-that means one less hem, braid or fringe to worry about- and I achieve this by threading a steel needle through the warp ends and lashing that to the loom bar. You need to lash it firmly so it won’t bend when you put tension on the warp. Once off the loom, the needle is removed and I pass the first weft tail through the end loops back and forth two or three times on a large sewing needle. Then I braid the other end or sew over the end and leave a fringe. The book mark sits within the pages of the book with fringe or braids protruding. Part of my mini warping board. I wrap the screws with paper to stop the warps from catching in the screw threads. Steel knitting pins and lengths of piano wire that I use to create a smooth start for my weavings. 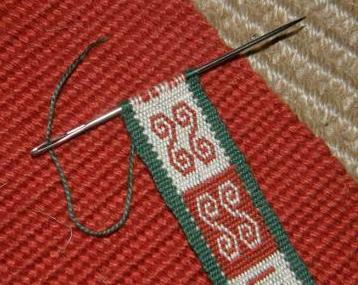 Finishing the smooth start by passing the weft tail on a large sewing needle. Finishes for bookmark ends-one has a sewn over edge with fringe and the other has 4-strand braids. 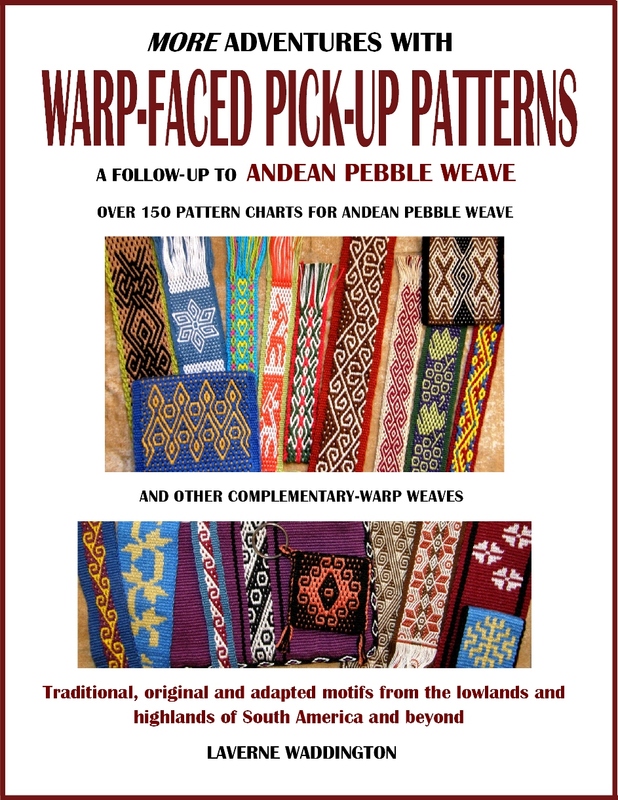 Two weavers from Yanque in Peru chose my bookmarks over the coin purses. Even the little guy got one! For a nice thin bookmark that is not too bulky within a book, I use a 35wpi crochet cotton and recently used it to make a double woven bookmark with a cute llama motif. I made this one with a plain weave border in two-weft double weave but it could just as easily be made in one-weft double weave. 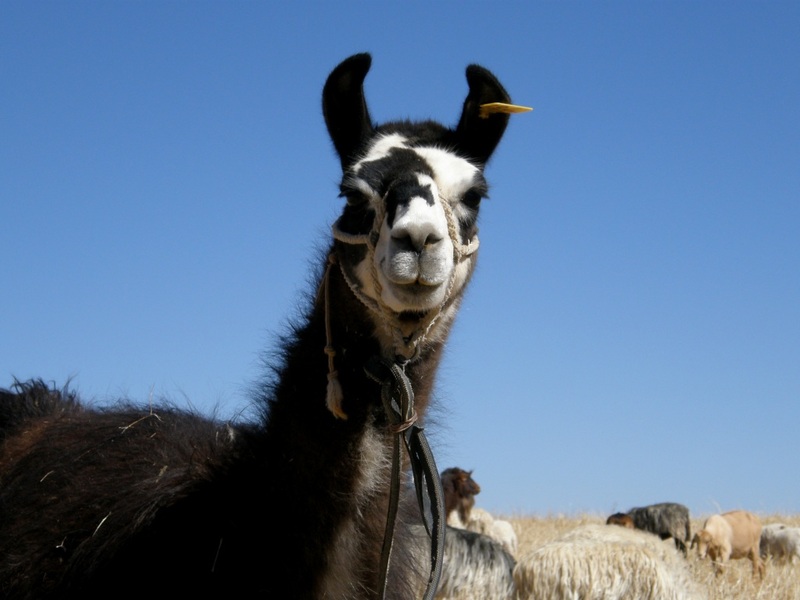 The llama is a much loved symbol of Bolivia and Peru but you certainly don’t need to be trekking down to South America to see this lovely animal anymore. There seem to be more than enough of them being successfully raised in many other countries around the world. I saw many on the outskirts of the city on my last visit to Sydney. There was even a llama festival on at the time. 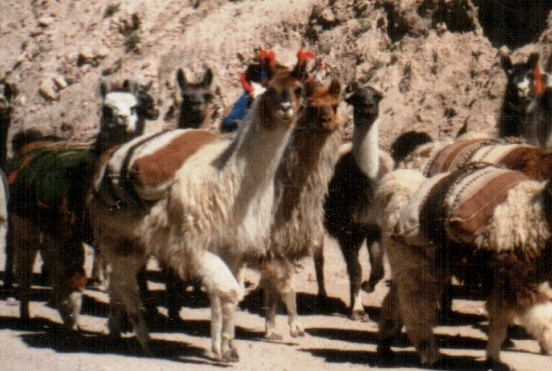 Here in Bolivia and Peru the llamas have many uses. They are used as pack animals for transporting grains in sacks, often woven from their own fiber, from villages to markets. 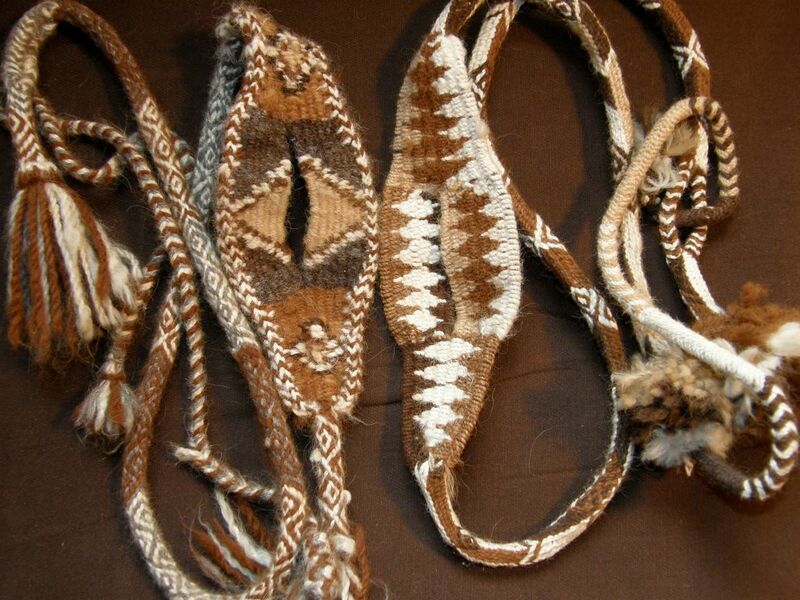 Their fiber is woven into blankets, coca bags , belts and other accessories as well as braided into slings and ropes. Their dung is used as a fuel for cooking fires and their meat is often enjoyed as charque-dried meat similar to jerky. 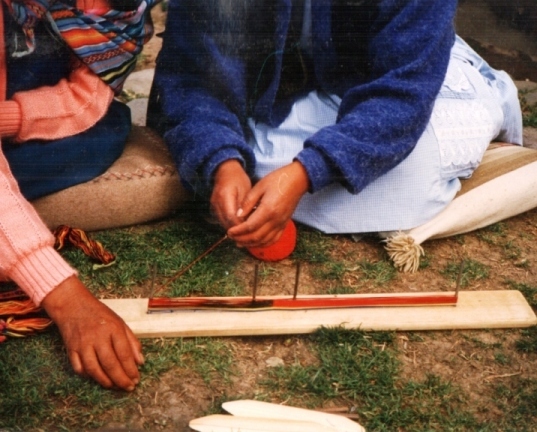 The bone from a llama’s lower leg is shaped into a pick up tool and beater-the wichuna-part of a weaver’s basic tool kit. Enterprising locals pose with their beautiful animals for tourists and they are irresistable! 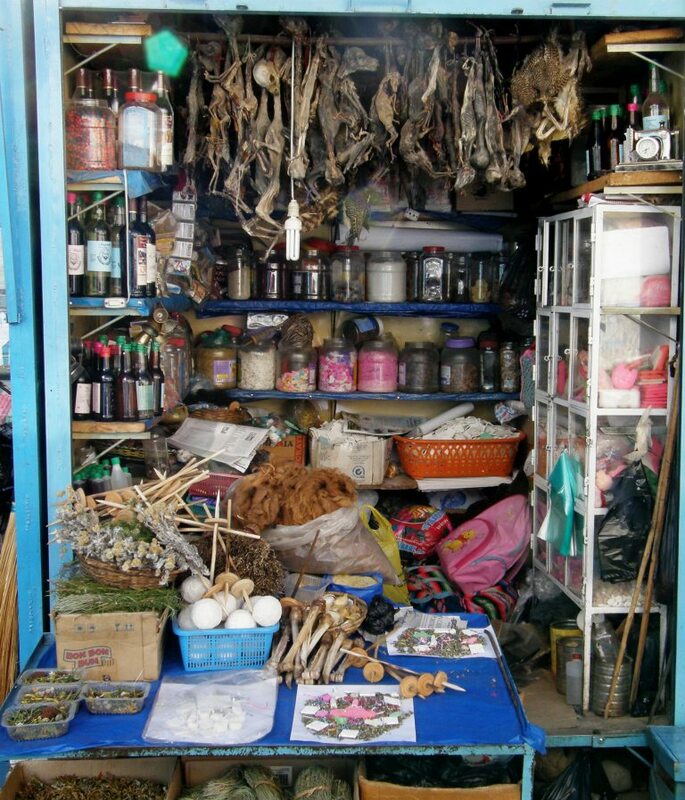 Dried llama fetuses are sold at the market stalls that sell homemade remedies. The llama fetus is buried at the cornerstone of a new house as an offering to PachaMama in the hope that she will bring prosperity to the home owners. 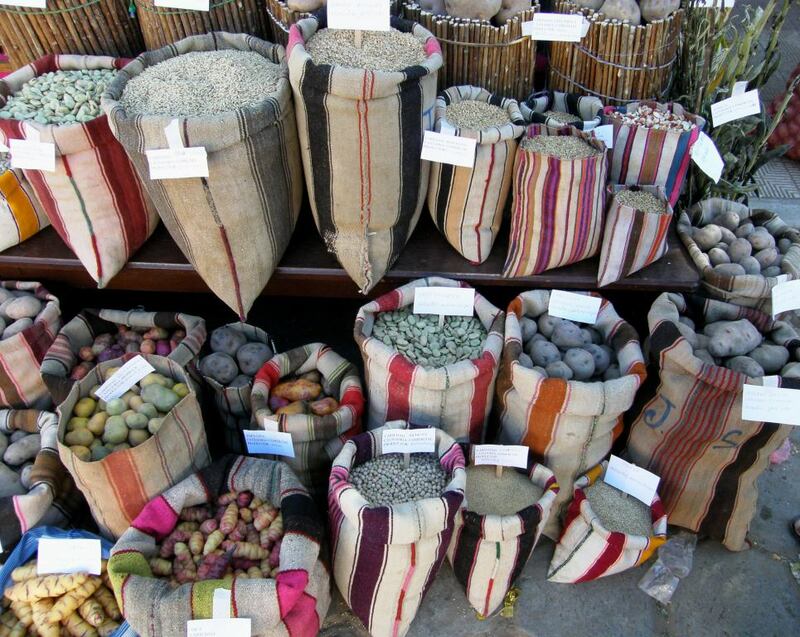 Produce at an agricutural festival is displayed in sacks made from llama fiber and wool. You can see the dried llama fetuses hanging up high in this market stall. On the table are drop spindles, llama fiber and wichunas. 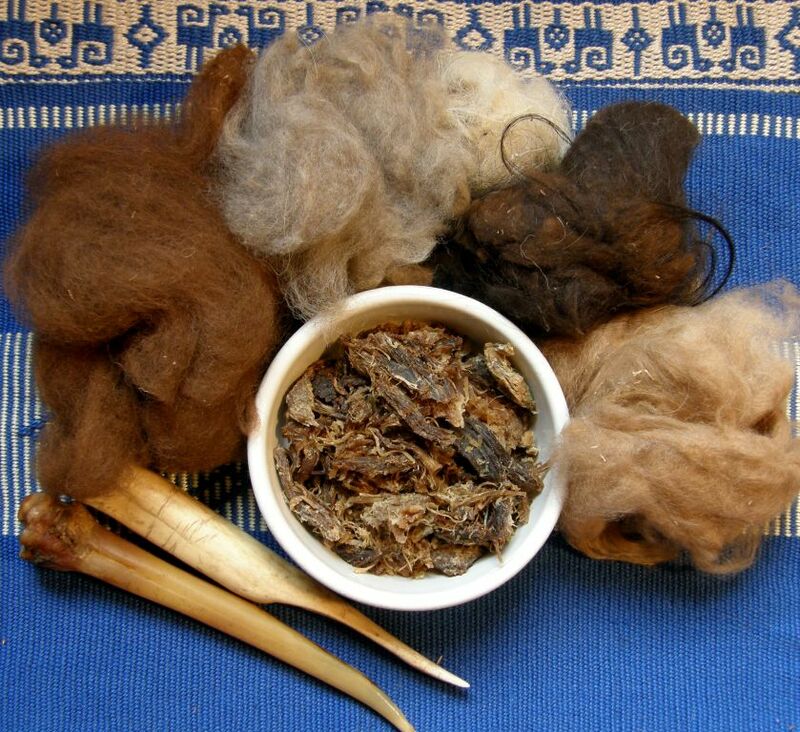 A closer look at llama ''charque'', llama fiber and two ''wichunas''. Slings, which are beautifully braided from llama fiber, are used, amongst other things, to hurl stones to help control animals wandering from the herd. 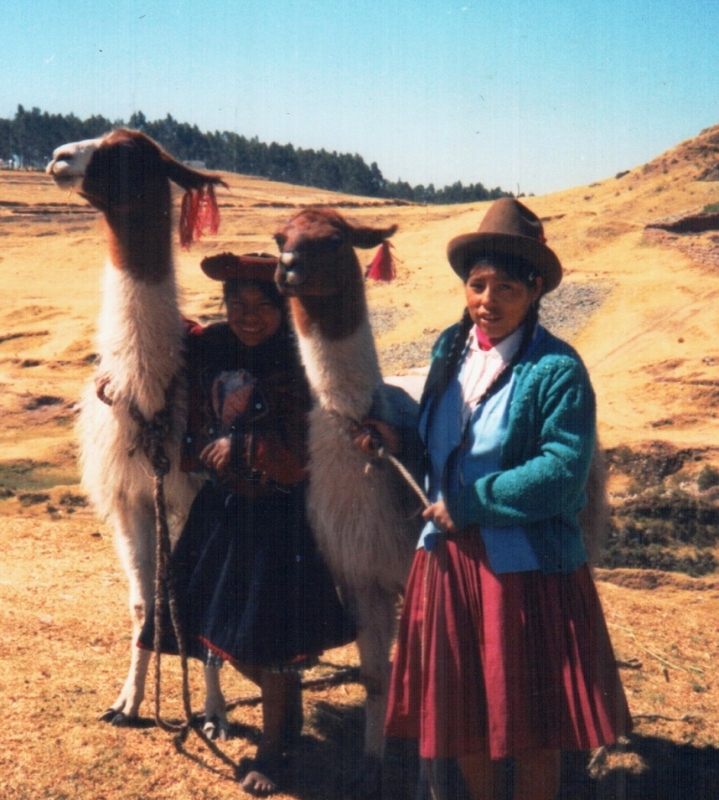 As there are no llamas here in lowland Bolivia where I live, I bought bags and bags of their fiber many years ago when I was in the highlands-enough to keep me occupied spinning and weaving for many years to come. I am no spinning expert and just do as I was taught here. The fiber needs to be spun very firmly to stand up to the weaving of warp faced textiles on the backstrap loom. All the weavers that I have studied with weave with a two-ply yarn and all spinning and plying is done on drop spindles. From left to right-two shoulder bags, a tool bag and a band that I used for a journal cover-these are all made from my handspun llama fiber. The yarn for the band was dyed after plying with cochineal, coca leaves and spearmint leaves. 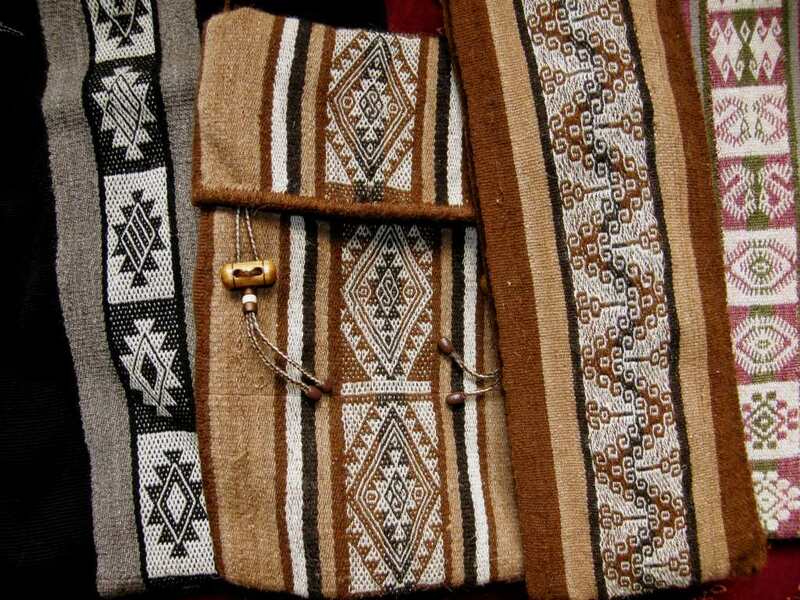 The designs are inspired by designs of, from left to right, lowland Bolivia, higland Peru, and highland Bolivia. 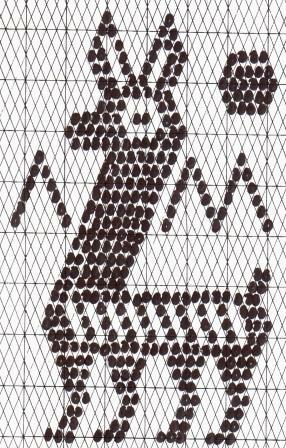 I thought that you may like to have the pattern charts for the four llama motifs on my double weave bookmark. And, once again, the real thing-on the road near Tarabuco, Bolivia grazing alongside sheep, goats and cattle. 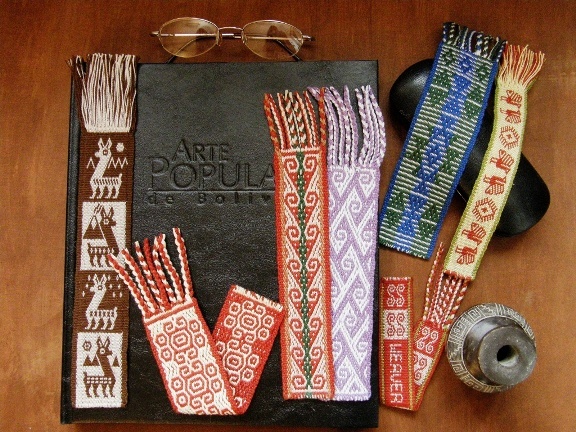 You could use these motifs in any project-not only in a bookmark. If you are not ready to try fine yarns yet, you could use a heavier yarn and weave them into a shoulder bag, for example. 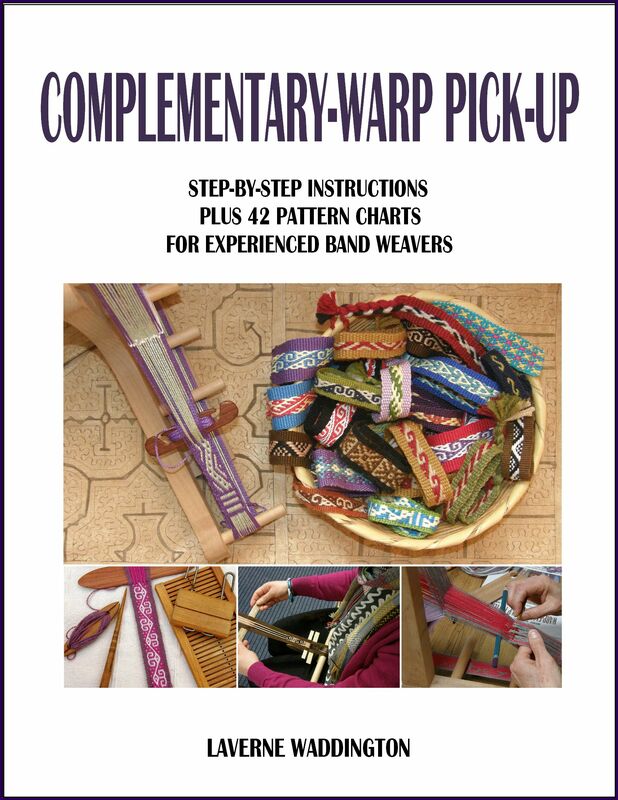 Don’t forget that you can access my free tutorial on one-weft double weave by joining Weavolution and the Backstrap Weaving Group. 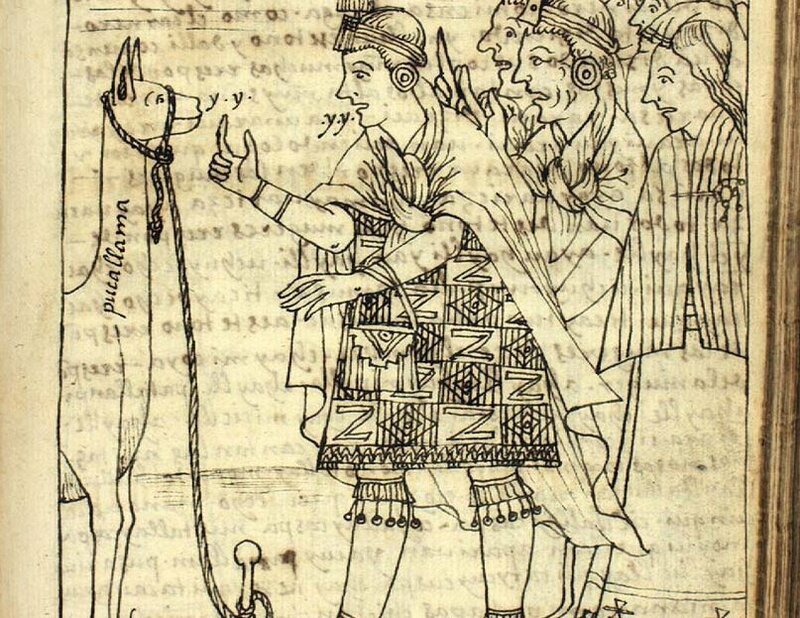 A full-page drawing by Guaman Poma de Ayala depicting part of a llama festival where a man is singing to a llama and, apparently the llama is singing back! Finally, I would like to share with you all a spectacular web site with hundreds of beautiful drawings like the one above.. This is the offiicial site of the chronicles of Guaman Poma de Ayala, an indigenous Peruvian of a noble family who became disillusioned with the treatment of the native peoples of the Andes by the Spanish after the Conquest. His nearly 1200-page chronicle, written between 1600 and 1615, is addressed to King Philip III of Spain and outlines the injustices of colonial rule. The 398 pages of drawings capture many aspects of daily life in pre and post Conquest Peru-festivals, costume, weaving, spinning, agricultural cycles, Inca royalty, government……..
You can view digital facsimiles of all the pictures in this chronicle here. An apology to subcribers to my blog who may have received multiple notifications. I have been doing some house cleaning and have moved pages around. One of the pages had to be republished which means that you would have gotten an automatic email notification for something that you had already seen. Sorry! Very interesting post. Thank you. I love the singing llama. Estoy muy impresionada con tus tejidos, objetos tan pequeños pero con tanto detalle demandan mucho trabajo. Una pregunta ¿esos tejidos quedan doble faz como las faja pampa? Eso es algo que aún no he aprendido a hacer y para lo que no hay maestros por estos lados. Saludos, como siempre un placer ver tus trabajos. Gracias por tu comentario. El tejido con las llamitas si, es de doble faz como las fajas pampa. 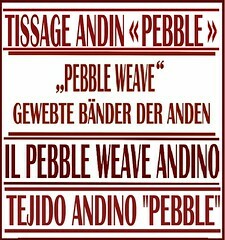 En Weavolution he hecho un tutorial con fotos sobre esta tecnica e hice una pagina con las instrucciones tambien en espanol. No estoy cien porciento segura de que todo el vocabulario esta bien pero creo que te podria servir para aprender esta tecnica. 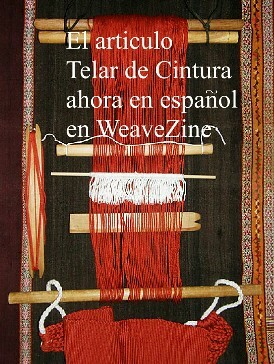 Tendras que registrarte en Weavolution (es gratis) primero y despues registrarte en el grupo Backstrap Weaving. Podras entrar en el foro y buscar la unica pagina en espanol. I love the llama designs! Now I really want to make something with them in it. It’s giving me lots of ideas now! Great! You have already gotten the mug rugs down! Hee! I love your little llama bookmark. I *just* finished weaving an actual backstrap, so I think I might just warp up one of those cuties and try it out! And your wonderful clear photos of all the other textiles are great to see, and so inspiring! Well you must show off your backstrap in the group at Weavolution. I have made a little gallery on the group’s front page and I would love to put it in there. Hey! Your llama band is excellent!! You jumped straight from backstrap to double weave-well done. Thank you for showing it here 🙂 Your blog looks great. The book, Letter to a King by Christopher Dilke published by Allen and Unwin in 1978 has an english translation of Huamon Poma de Ayala’s fascinating letter with its insite into the lives of the Inca before and after the invasion. It also has some of the wonderful drawings. Worth looking out for in second hand bookshops!! 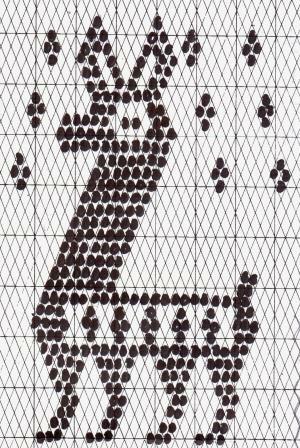 Lovely Llama patterns!! Thanks Laverne. Thanks for the tip on the book, Frankie. I must search online for that. I love the pictures of the llamas and I’ve never seen slings like these before, they are amazing! The Rachel Brown book you have in the background on one of the bookmarks photos is one of my favorites. Always a pleasure, Laverne. Muchas gracias. Yes, aren’t the slings great? I have more and they are all different. 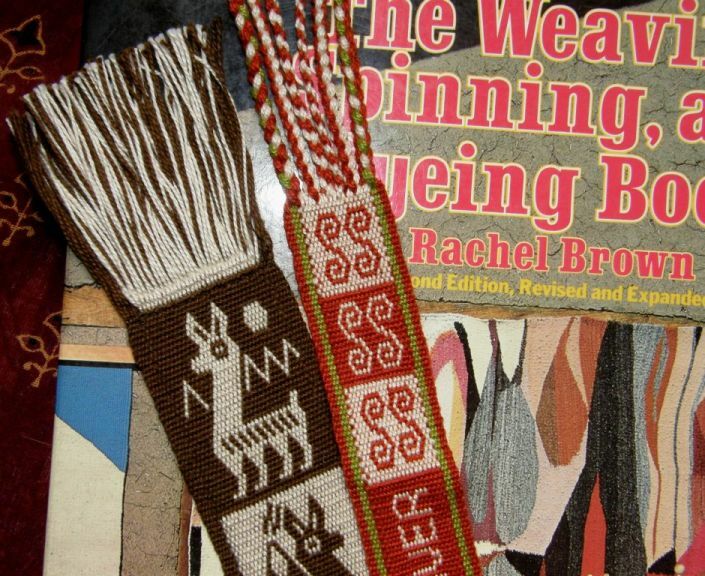 My Navajo weaving teacher back in 1995 suggested I take the Rachel Brown book back with me to Chile. I lived in the very south of Chile pre internet days with NO resources whatsoever so I simply devoured the book. 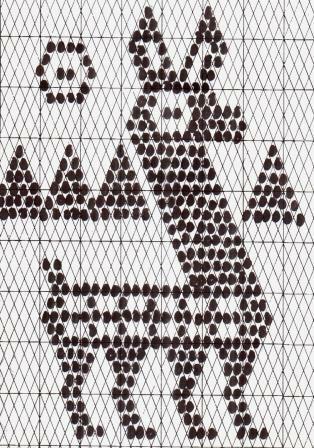 The book is very dear to me and I was lucky to get to visit Rachel’s studio in New Mexico in 1996.
great motifs on the llamas. I saw the alpaca slings at a “rondevous” — which for those of you not familar.. it is like a living histroy re-inactment for amueturss (no body gets paid, you pay to camp/perform or get on the “public” day). The time period aproximatly after the rev war… so about 1780’s to 1840’s. Rondevous– the word is from french and is when all the trappers got toether with the traders to trade the furs they traped over the winter for ‘trade goods’.. pretties… beads, silk, and usefull stuff… bullet molds, black powder rifle fixings, cloth, flour, coffee tea, soap, ect. Great post! I especially like the comment about the produce sacks. They are full of lovely food and you are looking at the bags! Yep, that’s me- the fiber geek. I share that crown with you though! May I be so bold as to enquire about the use for dried llama fetuses? I have been told by the stall holders in the market that the fetuses are buried when a new home is being built, either at the front door or at the cornerstone, as an offering to PachaMama in hte hope that she will bring the home owners wealth. 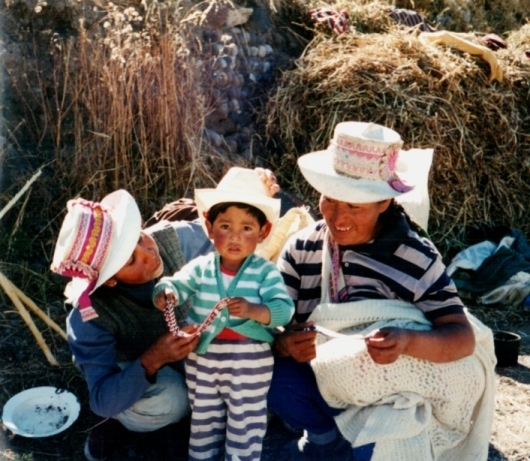 I love the photos of the different weavers and their families you posted. The drawing of the man and the Llama singing to each other is pretty cute. What was that drawing made of, Ink on Bark or was that drawing done on fabric? 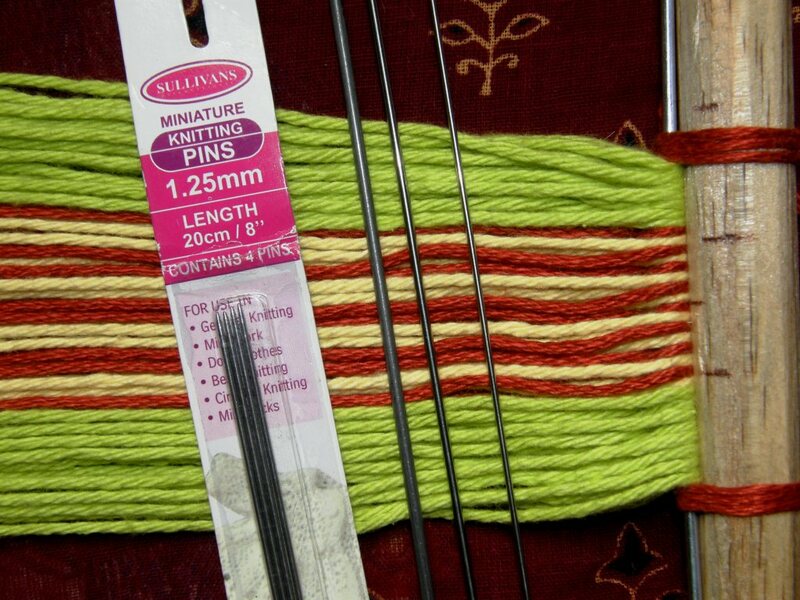 I like the idea of the tiny sized loom for weaving bookmarks. What type of yarn or thread you used to weave the bookmarks? The drawing is on paper. I am assuming it is ink. For bookmarks I use a fine crochet cotton or sometimes doubled sewing thread so they are not too bulky to go into a book. 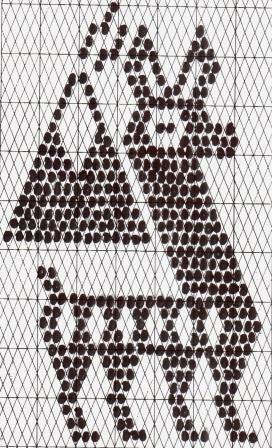 Do you have a pattern for alpacas? I have them and spin their fleece. I would like to use the pattern to make halters for them. 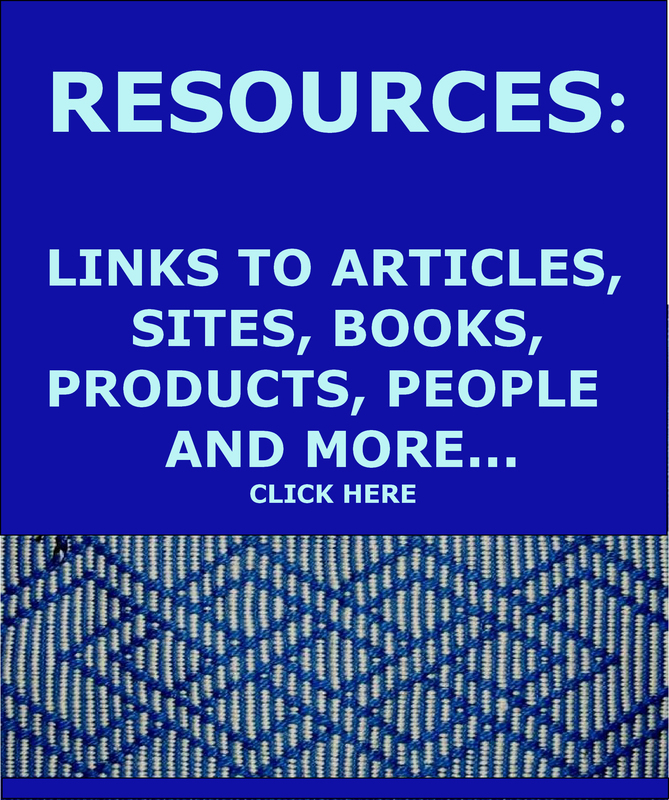 This is a great website and I wish I had found it sooner. I don’t but I ‘ll see if I can make one…..
Gracias por leer mi blog y espero que te guste mi libro. Mi novio es de Mendoza! In going back to review your earlier tutorials and rediscovering the source of a number of things I take for granted now, I thought I should write to thank you for techniques and pattern ideas – from the basic to the more complex. Thank you, Laverne.